This is life, imitating art. Copycat is a better word for it. 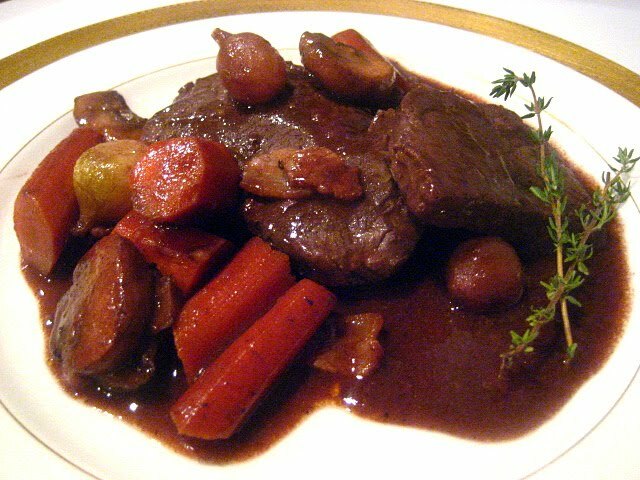 I made Ina Garten's Beef Bourguignon recipe to the letter (except that I used frozen pearl onions instead of peeling and boiling fresh ones....shhh). It came out PERFECT and DELICIOUS. Ina's recipe is easier (though much more expensive!) than a traditional French beef Bourguignon, because she uses a 3 lb. beef tenderloin (filet mignon), which cooks much faster than chuck. This recipe makes enough for 4-6 people, so save this recipe for company if you like. Another nice thing about this is that you can make it the day before, put it into the fridge in the pan it was cooked in, and gently reheat it. It was better on day 2, if it could get any better! Cut the filet crosswise into 1-inch-thick slices. Season with kosher salt and pepper on both sides. In a very large, heavy bottomed pan on medium-high heat, sauté the slices of beef in batches with 3 tablespoons of olive oil until browned on the outside and very rare inside, about 2 minutes on each side. Remove the filets from the pan and set aside on a platter. In the same pan, sauté the bacon on medium-low heat for 5 minutes, until crisp. Remove the bacon and set it aside on a paper towel-lined plate. Drain all the fat, except 2 tablespoons, from the pan. Add the garlic and cook for 30 seconds. 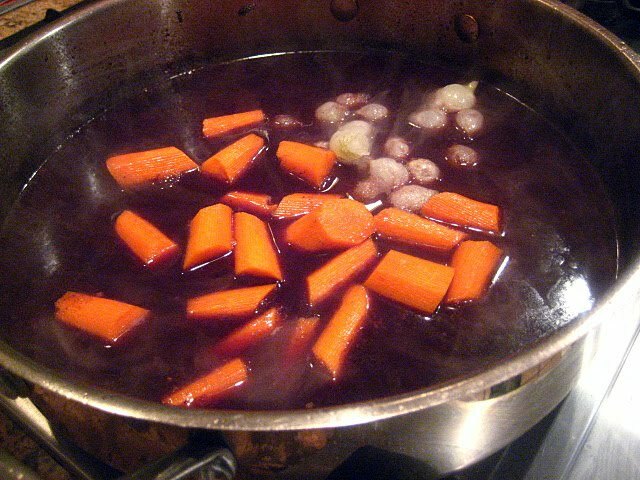 Deglaze the pan with the red wine and cook on high heat for 1 minute, scraping the bottom of the pan. Add the beef stock, tomato paste, thyme, 1 teaspoon of salt and 1/2 teaspoon of pepper. Bring to a boil and cook uncovered on medium-high heat for 10 minutes. STRAIN THE SAUCE (important step) and return it to the pan. Add the onions and carrots and simmer uncovered for 35 to 40 minutes (Ina calls for 20 minutes, but the carrots were not cooked enough so I increased the time), until the sauce is reduced and the vegetables are cooked. With a fork mash 2 tablespoons butter and the flour into a paste and whisk it gently into the sauce. Simmer for 2 minutes to thicken. 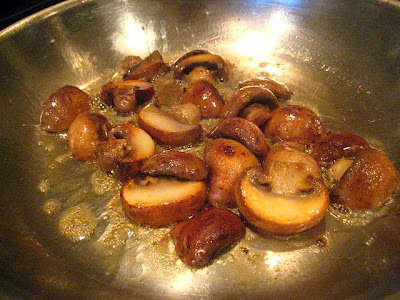 Meanwhile, sauté the mushrooms separately in 1 tablespoon butter and 1 tablespoon oil for about 8 minutes until browned and tender. 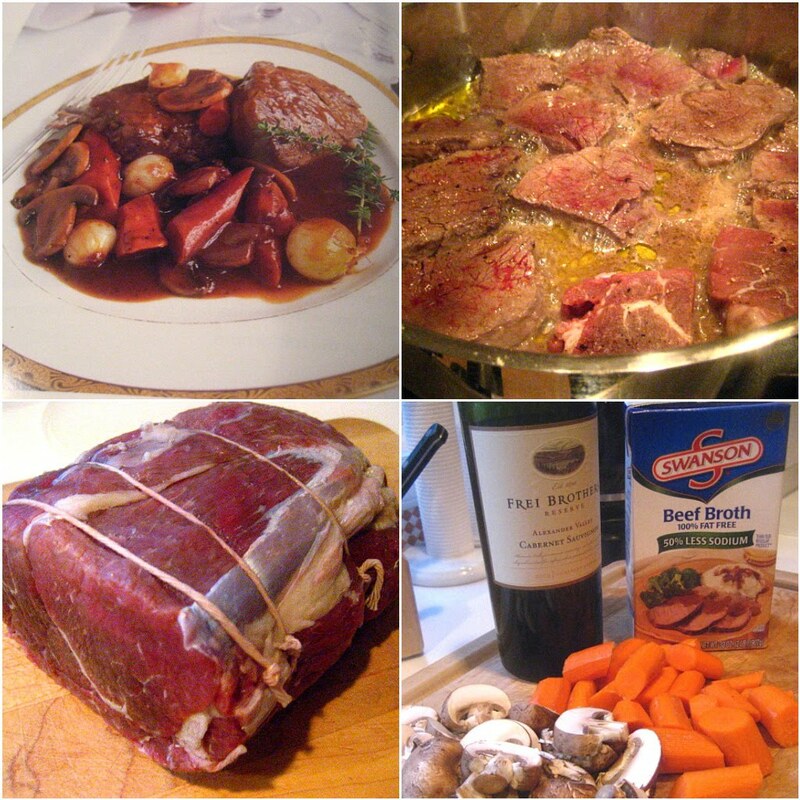 Add the filet of beef slices, the mushrooms and the bacon to the pan with the vegetables and sauce. Cover and reheat gently for 5 minutes. Do not overcook. Season to taste and serve immediately. (If making ahead, cool, then cover and refrigerate. Reheat over medium heat until heated through, about 15 minutes). Sooooo good looking. Feeds 5-6 normal people, but with my hoggy hubby it would probably feed 1 chubby 1/2 Japanese chick and 1 hoggy hubby. The perfect Sunday supper! I made Julia Child's version for recipes to rival but it was an all day affair. I've heard some people like Ina's better. PS I would have used the frozen onions too! I can only imagine how tender and flavorful that was. Your guests were some lucky people. I think I know what I will be making when the family arrives. This looks delicious...making ahead is a great idea. I think this will be our New Year's dinner! Even the kids will eat this! Thanks - by the way, any good recipes for prime rib? A great meal for a cold winter night. I have, yet, to make an Ina recipe that isn't good. Of course, she tends to use high end cost ingredients but this recipe makes it look worthy of the investment. I still can't decide what to make for Christmas Eve. I'd better flip a coin! What a perfect winter meal - it looks delicious! I love Ina's recipes. I've always wanted to make this, you can't go wrong with Ina, or Stacey for that matter! I like the meat's color! 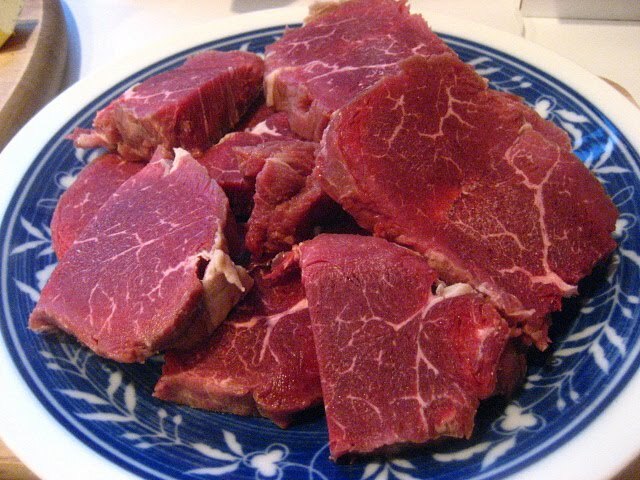 That is the perfect meat to use in every dish. Tender and fresh. This dish is bookmarked! Thanks. I rewatched Julie & Julia the other night and wanted to make this dish. Of course, what do I do? I make Ina's instead. Because it is so much easier. So good.